AbidingPeace is one of more than 5,000 organizations on LibraryThing. 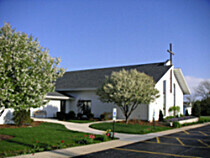 About meAbiding Peace Evangelical Lutheran Church exists to Preach God's Word, Teach God's People, and Reach God's World with the Abiding Peace found in Jesus Christ. We are a confessional, Bible-believing Lutheran congregation affiliated with the Wisconsin Evangelical Lutheran Synod (WELS). About my libraryOur growing library strives to provide our members with solid, biblical materials by which they might grow in faith and Christian living.